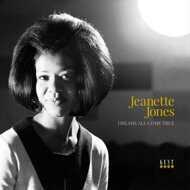 Jeanette Jones is one of the great unsung belters of 60s soul. Though she had just one solo release in 1969, Jeanette’s powerful pipes have come to be admired by many in recent years, thanks to the appearance of originally unissued tracks such as ‘Cut Loose’ and ‘You’d Be Good For Me’ on Kent and BGP releases. Jeanette first came to prominence as the lead singer of the Voices Of Victory gospel choir. Singled out by studio owner Leo Kulka, she was signed in 1968 and began work on an album, with arrangements by such notables as Rene Hall and Wally Cox. Just one single slipped out from the sessions in 1969, the stirring ballad ‘Darling, I’m Standing By You’. Despite the quality of uptempo tracks such as ‘Break Someone Else’s Heart’ and ‘Jealous Moon’, Kulka was unable to shop the album and Jeanette eventually disappeared from the music scene. Kent’s vinyl album “Dreams All Come True” captures Jeanette at her ebullient best with her complete solo recordings in one neat package with beautiful photographs from the late 60s. A true treat for anyone touched by the gospel power of this little-heralded, eminently soulful diva.